Today, I came across an interesting question regarding SALV OM Model. The query was regarding to show the count of displayed rows on the screen. Initially we think it is very easy – just use DESCRIBE table, get count and show. But we need to also remember that users can use the Filters. Users can also start with saved ALV Layout which could have filters and that will change the number of rows to be displayed on the screen. SAP doesn’t directly prepare the Data Table which it needs to display. It uses Data Provider (DP) to determine the display records from the Data table. This makes the task little bit harder to find out the Count of Displayed Rows. SET HANDLER me->set_after_events FOR lo_events. DATA: lo_filters    TYPE REF TO cl_salv_filters. DATA: lo_filter     TYPE REF TO cl_salv_filter. DATA: lo_selopt     TYPE REF TO cl_salv_selopt. DATA: lr_range      TYPE RANGE OF char80. DATA: lwa_range     LIKE LINE OF lr_range. DATA: lo_cols       TYPE REF TO cl_salv_columns. DATA: lo_col        LIKE LINE OF lo_cols_tab. LOOP AT lo_cols_tab INTO lo_col. lo_filter = lo_filters->get_filter( lo_col-columnname ). LOOP AT lv_filter_val INTO lo_selopt. CONCATENATE 'DEL_' lo_col-columnname into lf_form. v_rows = LINES( lt_data ). APPEND 'PROGRAM subpool.' TO tab. DATA: lo_cols TYPE REF TO cl_salv_columns. DATA: lo_col LIKE LINE OF lo_cols_tab. APPEND 'TYPES: ty_range type range of char80.' TO tab. APPEND 'TYPES: BEGIN OF ty_vbak,'  to tab. APPEND 'vbeln     TYPE vbak-vbeln,' to tab. APPEND 'erdat     TYPE erdat,'  to tab. APPEND 'auart     TYPE auart,'  to tab. APPEND 'kunnr     TYPE kunnr,'  to tab. APPEND 'netwr     TYPE netwr,'  to tab. APPEND 'END   OF ty_vbak.' to tab. APPEND 'TYPES: ty_t_vbak TYPE STANDARD TABLE OF ty_vbak.' to tab. INTO lf_string SEPARATED BY space. 'in lr_range.' INTO lf_string SEPARATED BY space. APPEND 'ENDFORM. ' TO tab. DATA: lo_display TYPE REF TO cl_salv_display_settings. Share you thoughts on this via comments ..! the only thing I wonder about is the statement “but we like Dynamic Programming” and then in the code lines I see ‘hard-coded’ field names as in “APPEND ‘vbeln TYPE vbak-vbeln,’ to tab.”. Ok maybe you forgot to remove this from test version. I think, GENERATE SUBROUTINE POOL can be avoided by looping at the display table, inside the loop loop over filtered columns until you found one that’s column matches the filter conditions, count line as filtered and go to next one. loop at diaplay table assigning . loop at filter table assigning . assign field -fieldname of structure to . That may be even faster because filters must be applied/checkd only until you find a filtered value. sorry, no code tags or other formatting means visible here. Glad to see your comment.. Yes you are right, I didn’t pay very much attention while declaring the internal table for the subroutine pool. I’ll fix it. Probably LOOP over LOOP could be faster than Generate subroutine pool, I need to try that out. For code formatting: we are working on something which can format the code. Working with both of your inputs I’ve worked the solution as follows, it uses the original proposal as above to determine the filters and then the LOOP within LOOP to determine the number of rows displayed in the TopOfList. Rather than using the generate subroutine the class cl_abap_typedescr is used to determine the internal structure and hence the field position in the data structure of the filters. Caching the filters allows for efficient processing of the filters, only processing the filters that are effective at that time. One thing that I’ve had to work around is the triggering of the event to refresh the top of list when a filter is applied. I’ve had to add a button to the report and trigger the top of page method to refresh the row count displayed. DATA: lr_header TYPE REF TO cl_salv_form_header_info. DATA: lo_col LIKE LINE OF lo_cols_tab. DATA: lo_filters TYPE REF TO cl_salv_filters. DATA: lo_filter TYPE REF TO cl_salv_filter. DATA: lo_selopt TYPE REF TO cl_salv_selopt. DATA: lr_range TYPE RANGE OF char80. DATA: lwa_range LIKE LINE OF lr_range. 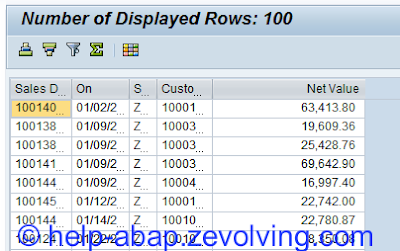 DATA : ref_descr TYPE REF TO cl_abap_structdescr. ref_descr ?= cl_abap_typedescr=>describe_by_name( ‘TY_LISTOUTPUT’ ). loop at lt_listoutput_cpy ASSIGNING . loop at lt_comp_details into ls_comp_details. lo_filter = lo_filters->get_filter( ls_comp_details-name ). lv_filter_val = lo_filter->get( ). “exception raised if filter not existing. LOOP AT lv_filter_val INTO lo_selopt. insert ls_filters into table lt_filters. loop at lt_filters into ls_filters. assign COMPONENT ls_filters-index of STRUCTURE to . DESCRIBE TABLE lt_listoutput_cpy lines lv_count. I am glad that the previous discussion between myself & Clemens helped you solve your problem efficiently. When I tried the first time, I tried using the HEADER, but SALV only sets the header once and doesn’t allow us to refresh unless we try to explicitly refresh it. Due to this fact, I used the title to display number of records. Another solution for this is to use the ‘count column’ field of the ALV class. If you combine this with the setting that totals must be shown above the data then the result is almost the same with much lesser code. Use method SET_COUNT_COLUMN of class CL_SALV_COLUMNS_LIST to identify the count column, the colum nitself can be left empty.